10-month-old Sadie Gutner wears a Mimo onesie with sensors at the Mimo headquarters Boston, Massachusetts, USA, on Mon., April 28, 2014. Sadie is the daughter of Mike Gutner who handles operations for Mimo, and she is wearing one of the company's onesies, made by Mimo, which has a variety of sensors on it. The onesie has a detachable frog-shaped communication device that transmits data from the onesie's sensors and sends the data to a smartphone app, which displays information about the baby's respiration, skin temperature, position, and activity level. The onesie is washable and the device is water-resistant. Dulcie Madden, co-founder and CEO of Mimo, displays a baby onesie that Mimo manufactures in Boston, Massachusetts, USA, on Mon., April 28, 2014. The onesie has a detachable frog-shaped communication device that transmits data from the onesie's sensors and sends the data to a smartphone app, which displays information about the baby's respiration, skin temperature, position, and activity level. Partially assembled Mimo smart monitor devices lay on a desk at the Mimo headquarters Boston, Massachusetts, USA, on Mon., April 28, 2014. Mimo manufactures a baby onesie that has a variety of sensors on it. 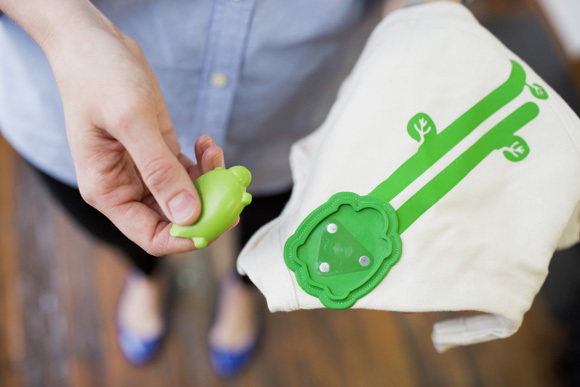 The onesie has a detachable frog-shaped communication device that transmits data from the onesie's sensors and sends the data to a smartphone app, which displays information about the baby's respiration, skin temperature, position, and activity level. The onesie is washable and the device is water-resistant. Dulcie Madden, co-founder and CEO of Mimo, holds 10-month-old Sadie Gutner at the Mimo headquarters Boston, Massachusetts, USA, on Mon., April 28, 2014. Sadie is the daughter of Mike Gutner who handles operations for Mimo, and she is wearing one of the company's onesies, made by Mimo, which has a variety of sensors on it. The onesie has a detachable frog-shaped communication device that transmits data from the onesie's sensors and sends the data to a smartphone app, which displays information about the baby's respiration, skin temperature, position, and activity level. The onesie is washable and the device is water-resistant. 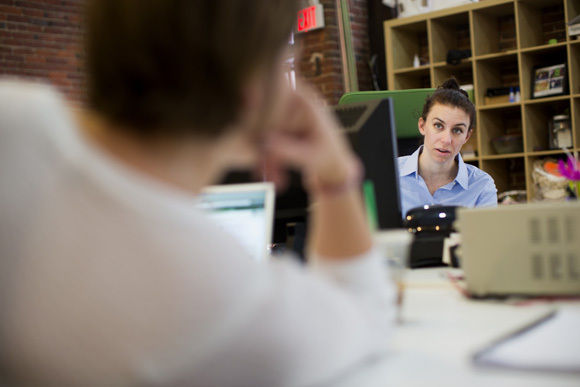 Dulcie Madden, co-founder and CEO of Mimo, speaks with community manager Corrie Luongo at the Mimo headquarters Boston, Massachusetts, USA, on Mon., April 28, 2014. Mimo manufactures a baby onesie that has a variety of sensors on it. 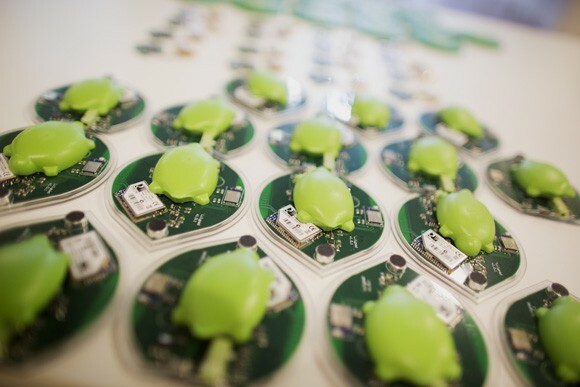 The onesie has a detachable frog-shaped communication device that transmits data from the onesie's sensors and sends the data to a smartphone app, which displays information about the baby's respiration, skin temperature, position, and activity level. The onesie is washable and the device is water-resistant. For a Wall Street Journal piece on wearable technology for babies, I photographed Rest Devices co-founder Dulcie Madden and the Mimo smart baby monitor at the companies headquarters in downtown Boston. It’s the first time I’ve really photographed a baby, so the shoot presented some challenges. The story is available online at the Wall Street Journal website and there are more pictures from the shoot available in my archive.